When you find yourself in a new city, whether it's on holiday with family or friends or on a work trip, the last thing you want is to buy dinner from 'that place the locals avoid because they all know the person who calls themselves a chef reheats prawns in the microwave'. 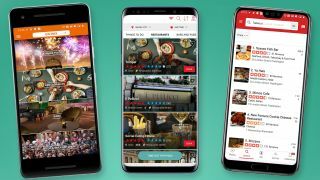 The good news is there’s a small army of free smartphone apps that will help you find the best eateries in any town, big or small. Whether you want a blow-out three-course meal, or just want to find the best on-the-go falafel wrap, there’s an app for the job. Our guide includes apps you may have heard of, and a few you probably won't have, offering user reviews, pro reviews and app-based table booking, and even speciality apps to help you track down the places vegans can eat without worrying if there’s meat in the noodle broth. There are curated food apps, and those that rely on user reviews. Dojo is a fully-curated app, and it doesn’t offer any random family restaurants, or bargain eateries. Dojo is about what’s hot, and what’s cool: the places where the people who wear trends that haven't even appeared in Vogue yet can be found. Don’t skip this one if you have an aversion to hipsters, though. Dojo offers some genuinely interesting and worthwhile food suggestions that would never bob to the surface in an app like TripAdvisor. It posts reviews of restaurants too, with write-ups just a couple of paragraphs long to keep things snappy. An institution when it comes to advice on great nights out, Time Out has been around for 50 years now. It covers major cities across the world, and publishes review scores by its own critics and customers. That’s people like us. Time Out lets you find new and interesting spots without feeling that you’re in danger of becoming a slave to the latest trends. You can also book tables from within the app. It's not just for restaurants and cafes, though – Time Out is also one of the best resources if you're looking for something to do before or after dining. HappyCow is dedicated to vegans out there who still struggle to find somewhere that actually serves good vegan food, not just pasta with tomato paste with non-vegetarian parmesan on top. HappyCow does have quite a ramshackle design, and a basic layout that won’t win any awards. However, the content is invaluable. You can search for vegan and vegetarian restaurants, as well as those with veggie options, although if you’re after the latter you might as well use one of the bigger apps. The best part is how HappyCow has been embraced by the veggie and vegan community, so you’ll find plenty of user reviews for most locations – just because a restaurant is 'vegan' doesn’t mean it’s any good. Formerly known as Urbanspoon, Zomato is the 'other' big restaurant-finder app, alongside TripAdvisor and Yelp. It’s the least popular of the three, although it has quite a following in India, where the main Zomato team is based. Should you use Yelp, Zomato or TripAdvisor? All have very large databases, and while Zomato has the smallest userbase, there’s still enough to fill most restaurant listings with reviews. Menus are where Zomato puts in extra effort. Yelp often offers a link to the restaurant’s menu webpage, but Zomato is chock full of actual photos of menus. This is handy for smaller places that may not have a website, or one that hasn't been updated in the last two years. Many don’t think of this as an app at all, but Google Assistant is one of the best ways to find somewhere nearby to eat – if you have an Android phone, anyway. Just typing (or speaking) “pizza”, “Thai” or “curry” into the Assistant interface is enough to get you a whole bunch of nearby suggestions from the great Google database in the sky. Listings appear based roughly on the same criteria as TripAdvisor. A closer location and better user reviews will mean you’re more likely to see a restaurant appear. Google Assistant wins the prize for sheer quick-fix results. Right at the top you’ll see just a few suggestions rather than the endless lists Yelp and TripAdvisor offer. You’ll see similar results from searching in Chrome or Google Maps, mind – as ever with Google, they’re all linked. You probably already know about TripAdvisor. It collates millions of reviews of restaurants, cafes, pubs, hotels and attractions from around the world. Even if you don’t trust totally user-based review systems, there’s fun to be had here reading about the terrible experiences some patrons have had. If you'll need to find nearby restaurants in another country while on holiday, don’t forget that you can download listings for many big cities, which saves you having to risk racking up high roaming charges. To download a city, type its name into the app search bar and then scroll down its page. You have to flick through a lot of thumbnail images, but you should see a download link with an indication of how much room the city will take up – London, for example, is only 111MB without photos, which is a data bargain. The major alternative to TripAdvisor, Yelp focuses on locals looking for places to go rather than travelers. The core concept is the same, though, with Yelp powered by user reviews. These determine a restaurant’s rating, and written reviews let you look into whether there have been recent rodent sightings, or reports of the “worst service ever” – although a lot of places seem to have that, according to the app's users. A blog-style section makes Yelp feel a little different to TripAdvisor, though. There aren’t Time Out-style articles based on staff picks, but more fast-moving weekly rankings based on the recent reviews of 'Elite' Yelp-ers. This UK app is known for its delivery service – it’s perfect for finding local takeaways which don't have the money or time to create an inviting, professionally-made website. You can order for collection from Just Eat too – just select Collection instead of Delivery at checkout. You can even pay with cash, meaning you pay no money through Just Eat at all. This is an established company, though, so don’t shy away from paying with a card. Just Eat is a great app for lower-cost, classic takeaway meals, particularly curries, pizza, and Thai and Chinese food. This is the premier app for booking tables at restaurants, because so many eateries actually use OpenTable’s system to manage their bookings. In TripAdvisor you might search for nearby pizza restaurants, but with OpenTable you can look for places with a table for four available at 7pm. Thanks to that tight integration with the establishment itself, you can often look through the whole menu as you browse too. This isn’t quite the best app to get the nitty-gritty on restaurants, though. There is a reviews section, but you don’t get to see 'candid' reviews of the food, as seen on TripAdvisor. Still, if you want to organize an evening without having to worry about finding the restaurant of your choice fully booked, download OpenTable right away.